Title : The Shia: Identity. Persecutions. Horizons. This book is a good introduction into a modern Shia perspective for both Muslims and non-Muslims. It is written with the objective of pursuing inter-religious harmony and defeating sectarian agendas. 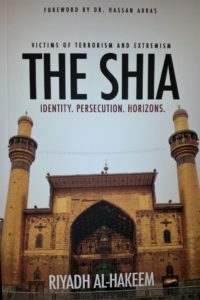 The author discusses the key principles of Shia Islam, provides a history of the origin and struggles of Shia Muslims and an introduction to their sacred places, holidays, religious practices and social organization. An account is given of the Shia presence over the centuries across the world. There is a broad overview of politics and leadership, a survey of important seminaries and places of learning in the Shia world and a list of genocides that have been perpetrated against Shia Muslims. The final chapter contains a vision of the author’s prospects for a bright future contingent upon certain steps being taken by the Shia. The book is accessible and not overly lengthy. This book is part of the MARC library collection.